Wanted: Laborers in the vineyard. No previous experience required. Whether you have been coming to Spring Meadows for 2 weeks or 20 years, these questions may sound familiar. I have heard them from church veterans and newer guests. Usually the veterans are so in tune with the rhythms of the church, it is difficult for them to re-learn what it is like to be the new person. They end up remarking at all the ‘new people’ yet they seem at a loss as to how to integrate them into their lives and homes. On the other hand, the newcomer may be overwhelmed by what appears to be a closed network of happy church-going people who already know how to ‘do church’ and therefore they sit passively on the sidelines waiting for one of the more seasoned members of the church to reach out to them. What’s the result? An unspoken stalemate in the life of the church: The comfortable establishment vs. the bewildered guest. Thankfully, Jesus Christ has given us two pictures of the church to help us get at the heart of this tension. In this image, the inspired Apostle tells us that all the people in any given church are like a household that is constructed on top of the foundation of the teachings of the apostles which are set in place only after the chief cornerstone, Jesus Christ, is set in place. Therefore we expect church to have a certain shape. The Bible gives just a rough outline of this shape, but we know that church government, preaching, sacraments, witness and fellowship are some of the essentials. These images tell us that the church is also an active, living organism. Though there exists structure in the life of the church, there is also an unpredictable principle of life that springs forth from the church as it is rooted in the soil of God’s electing grace. This is why we must struggle every day as a church family to relate to each other in light of how God relates to us: as a kind father who has adopted us into his family for the sake of the work that his Son accomplished in his death and resurrection. This is the gospel soil from which the church grows; the foundation upon which the church is constructed. We need to hold each of these images together in our minds when we speak about church. There will be both institutional and organic dimensions. As you cannot nurture and raise children in an unstructured environment, so the church cannot nature and raise humanity without leadership and structure. In all cases the gospel of Jesus is the root of the organism and the foundation of the building. Let’s now revisit my question above. The church veteran seems to be misunderstanding that it is 100% his responsibility to love, welcome, and nurture the new guest to church. His comfort zone is the institutional expression of the church; it’s programming, small groups, and established friend networks. The newcomer has not yet understood that he is called to be a co-laborer in the garden of God. He is commanded to start doing ministry from day one, loving, serving, and connecting with those around him. In each case, the veteran and the guest must see that Jesus Christ and the grace found in him is their life-giving source of power. How does this work out in Spring Meadows? There are at least 100 instances where Christians in churches are called to “one another” each other (e.g. love one another, forgive one another, bear one another’s burdens….) We obey these commands by seeking out relationships to move towards one another in love. First, we see that an individual Christian at SMPC reaches out to someone else on a one-to-one basis. He did not wait for anyone to initiate towards him, and neither is he directly interfacing with any program of SMPC. This Christian continues to invest his time in continual discipleship of the believer. He is building a relationship based on their mutual love of Christ. Eventually, this system replicates much like a living organism. Newly trained coworkers begin to invest their time into others. 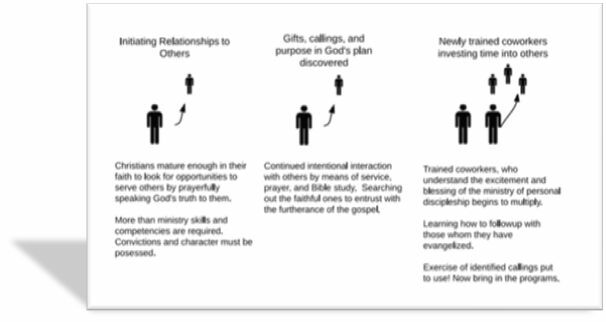 On the institutional side of things, we see how a particular “Plan of Discipleship” operates in Spring Meadows. This is the trellis on which the vine grows. In this figure we start on the left at “Intro to SMPC.” This is the new members class where persons who are interested in making a commitment to our church family come to learn about SMPC and ask questions about things they have seen. Coming to this class may lead to a “Membership Interview,” where the elders examine the inquirer and review the five membership questions which they are going to be asked. Membership is confusing to many, but it is a visible way to express that you desire to settle down and be a member of the SMPC family. Also at this time, the new members are placed under the care of one of the Ruling Elders. The elders are commanded to pray and encourage the flock. This is how they obey the Scriptures in keeping watch over the flock of God. The larger ministry of the church is divided into three overlapping parts: knowing, serving, and nurturing. Any ministry of the church, from children to music to women’s ministry falls under one or several of these categories. From here, it is the hope of SMPC that believers are being equipped to be sent into their workplaces and city to be a well-trained ambassador of Christ. Both the organic and institutional characteristics of the church must be present. Man shall not live by programs alone, but neither can we expect nurture without organization. Each of us are called to ask Christ for wisdom on how we are called to serve in his body, the church. Plead with the Lord that he would use his appointed means to make you a disciple, and that his Holy Spirit will minister the gospel to your heart through his word to move you to seek out ways to build and grow others up into full maturity in Christ.